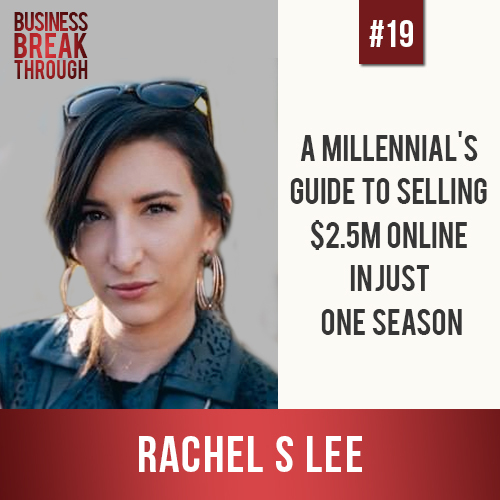 Rachel S Lee and her partners had over $2.5 million in online product sales using only keyword research, Facebook advertising and ClickFunnels, this past winter. In this episode Rachel shares with us the secret of being successful with a laptop business, giving you the freedom to work successfully from anywhere, anytime – she tells us about affiliate marketing. Rachel also speaks about a really relateable struggle of that guilty feeling, worrying that you are working too much or too little, never knowing how much to post on social media, feeling like you’re posting too much, too little – for which we came up with a strategic solution. Rachel S Lee teaches people how to make passive income with their laptop through affiliate marketing. She loves to create new content for her YouTube and online course and is a Clickfunnels 2 comma club winner and soon to be a Clickfunnels dream car winner. She is an author of 2 books and has spoken on dozens of stages in Southern California. She always has fresh resources and trainings at Rachelslee.com. Got a college internship in digital marketing while still exploring what she was going to do with her future. Worked there for a while then realized she could do it herself. Started her own digital marketing agency taking in whatever business came her way, doing some of everything. Got involved with ClickFunnels, and met her business partners for e-commerce business through them. Fell out with partners and realized that she could run an entire business on affiliate marketing. To get Facebook traffic, even organic traffic, you’re looking at either spending your whole day on it or hiring assistant (with hourly rates varying between $4-$25 depending on country of origin). Either way it will cost you in money or in lost time which is lost opportunity for you to work on anything else. PPC ads (paid traffic) can be very lucrative but you must do A/B testing if you want to be successful. It takes a huge amount of time tweaking the three key components: (1) keyword and audience targeting, (2) messaging and content (image/video/wording), (3) sales funnel (the page it takes them to). Facebook chat bots are a great way to build an audience. Offer something in a Facebook group and have people respond with an “I’m in” then respond to them through chat bot. It’s almost like having a Facebook email list that gets into Facebook Messenger. Build a personal brand on YouTube, adding affiliate links in the description. Choose your videos based on trending keywords. Like so many of us, Rachel feels guilty – guilty that she may be working too much, guilty that she may be working too little; feels guilty that she is posting on social media too much, guilty that she is posting too little. How much is enough? In marketing, many suggest a 10% marketing budget off of gross revenue. When you are a service provider, your marketing budget is time and involvement, in addition to money! So take 10% of your time to work on your business development. It is also so important that you work strategically. Have a goal, put 10% of your time and see if you’re reaching that goal. Test the market – how much is enough for you to get out what you need from it?